There is a grave problem in both Itanagar, and Naharlagun, the twin capital town of Arunachal Pradesh. That problem is the large number of stray animals on the roads. These animals, can be seen in large numbers at any hour of the day and night and this is creating serious problems for road users. There are a lot of accidents, resulting in everything from minor damage to fatalities. DC Capital Complex Incharge Talom Dupok said that Executive Order have already been issued to all sector magistrate include capital Police. It is the matter of verify ” why the order not been implemented”. He assured to review with the administration soon to take necessary action on ground as he too have information about the stray animals loitering on the capital road. One of the youth leader from Niti Vihar said that the capital district administration have already issued order but it is never implemented for more than a week and the innocent commuters have to suffering. Further he said that only issuing order will not serve the purpose as several accidents have been witness in the capital. One local resident of Zero Point Tinali said I was on my way from Naharlagun in evening at around 8 PM and it was dark but suddenly a pig come on the road and he meet with accident. His two wheeler gets damage and have to bear more than 8000 bucks of no faults. 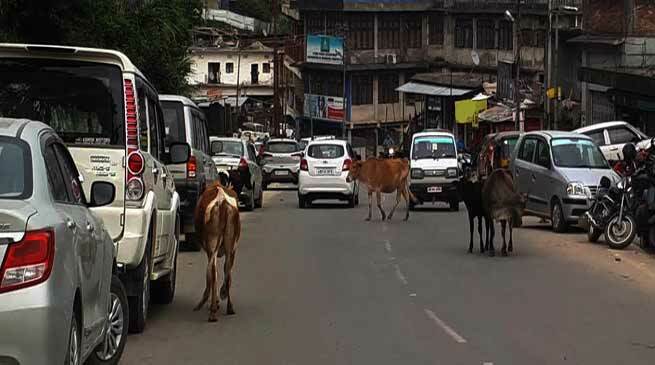 One driver said that it is very unfortunate as the owners left their animals on road for freely move and they even don’t care to have barricade which makes lots of inconvenience and disturbances on the highway and the commuters have to face every day.